Included with your 1st shipment. 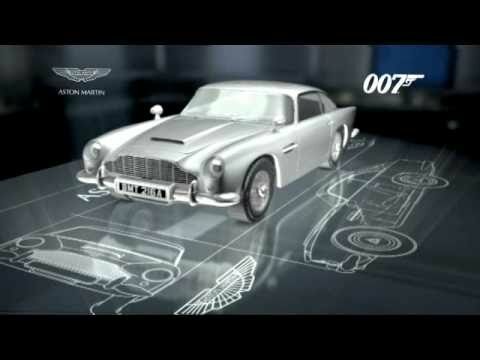 An image of the complete build with a breakdown of each part of your Aston Martin DB5. Included with your 2nd shipment. See the design all at once in the 4x Part Identification Sheets. Included with your 3rd shipment. Hold all your magazines and instructions in this convenient binder. Included with your 4th shipment. 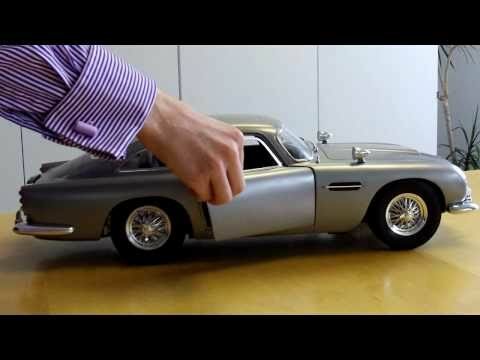 Get the 1:43 scale version of your die-cast model in a specially-recreated scene from Goldfinger. Included with your 8th shipment. 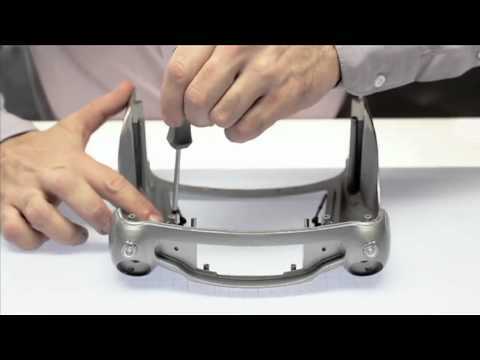 As your DB5 comes together, you'll receive your display base to showcase your build. The model includes all the additional features that were seen in Goldfinger, from the rotating tyre slashers to the ejector seat. The model has a detailed interior. The engine has been carefully based on the real thing, complete with six cylinders and overhead camshaft. The dashboard is a scale replica of the real thing: the steering wheel actually turns the wheels and the entire dashboard lights up at the press of a button. The horn works too. The rear and front lights on the model can be switched on - the brake lights can be activated by pressing down on the brake pedal. The ejector seat is fully functioning and is activated by pushing down on the gear stick. The roof panel should be removed to prevent damage. The console for the tracker device lights up and flashes to plot the position of Goldfinger's car. No details have been overlooked, and even the model's radio aerial can be pulled out to its full height. In Goldfinger rear tire scythes burst Tilly Masterson's Mustang wheels. On your model, the slashers can be extended out and pushed back in. The car is fitted with rotating back and front number plates that show three different registrations - British, French and Swiss. Lift the armrest between the front seats to reveal the controls for all the DB5's extra features. Every Issue comes with a completed instruction manual as part of the magazine. Subscribe risk free to start building your DB5 for only $1.95 + FREE SHIPPING. Get four new issues delivered to your door each month for only $10.90 + $1.95 S&H per issue. Build, enjoy, and relax. Your subscription is risk free and there is no minimum number of issues to purchase. You may cancel at anytime. No questions asked. Order today and receive the first two issues to begin your DB5 Build for only $1.95 with free shipping and handling. After you receive your introductory package, you will receive 4 new issues containing parts and magazines every month to continue building your Aston Martin DB5. You will automatically be charged only $10.90 per issue. Shipping and handling is just $1.95 per issue. You will also receive 3 fantastic free gifts during your subscription. How many issues are planned for the whole collection? Your collection is complete in 86 issues, spread over 22 months. The website is not working properly for me, what should I do? You can contact our customer service team at [email protected] or call 1-800-261-6898 (Monday to Sunday, 8 am - 10 pm EST) . If you email the team, please include your name and subscription reference in the subject line. ™ and related James Bond Trademarks © 1962-2018 Danjaq, LLC and United Artists Corporation. All Rights Reserved. ™ and related James Bond Trademarks are trademarks of Danjaq, LLC licensed by EON Productions Limited. Aston Martin, the Aston Martin Wings logo and the model name “DB5” are trademarks owned, licensed or used by Aston Martin Lagonda Limited. All rights reserved. Non ™, James Bond or Aston Martin content © 2018 Eaglemoss Publications Ltd. Authorised user Eaglemoss Ltd.